Here’s the rough draft of the itinerary for my upcoming road trip leaving next week! Woo Hoo! I have now switched gears, yet again, from buying a tear drop camper, to buying a van, to camping, to Couchsurfing! If you’ve been a follower for a while you’ll recall my wonderful experience Couchsuring in Cape Town for four nights (read about it here)! I’m putting out a few requests and will have my tent and camping gear with me in my Honda Civic for occasional camping. I’m not finished researching the areas, so I don’t have all of the sights/activities listed I hope to see/do! I’d love to hear from you if you’ve been to any of these areas and have recommendations! Drive 6 1/2 hours from Cincinnati to Asheville, N.C. and stay for 3 nights. Visit The Biltmore Estates and take the Gray Line Trolley (hop on/hop off) to see the sights around town. Drive 4 1/2 hours to Charleston, S.C. and stay for 3 nights. Drive 2 1/2 hours to Savannah, Georgia and stay for 2 nights. Drive 7 1/2 hours to Destin Beach and stay 7 nights exploring the beautiful beaches in the area including Fort Walton, Pensacola, Rosemary and Panama City Beaches. Drive 7 1/2 hours to St. Petersburg Beach/Tampa Bay area and stay 3 nights. I’ll probably be staying with a fellow blogger…the beautiful Zully from Spiritual World Traveler, if she’s in town. So exciting! Drive a little over 4 hours to Miami/Ft. Lauderdale beaches and stay for 3 nights. Drive almost 3 hours to Cape Coral (Ft. Myers Beach) and stay for a few weeks. Family members have a condo there that they generously allow me to use. I’ll be picking my husband up at the airport the day before Thanksgiving and he’ll stay for a week. I hope to meet Betty from Heifer 12 x 12 on this trip also! I’m thinking on the way back will work better for her because she is visiting a different country every month this year and blogging about it! It’s amazing and she’s amazing! I enjoy reading other traveler’s itineraries…so…here’s mine for my upcoming trip to Africa at the end of this month! I added up the amount of travel hours (mostly driving) and it is an unbelievable 129 hours! That’s over 3 weeks of 40 hr. work weeks! I know it will be worth it though!! I fly from Dayton–Detroit–Amsterdam–Cape Town. About 28 hours of traveling time when you account for the drive to the airport, waiting time, and getting to the hostel in Cape Town. I don’t arrive until late evening, so my day 1 begins the following morning. Day 1 – no plans yet. Day 2 – take an all day tour of sites around Cape Town…including Cape of Good Hope and quite a few other spots along the coast. Day 4 – No plans. (I want to utilize the red/blue hop on/hop off buses around town). I’ve also touched base with a fellow blogger who lives in Cape Town and hope to meet up with him. I need to check out of my hostel and move over to the hotel that is included in my G Adventures trip. I’ll be meeting up with the group in the evening. Day 7 – Drive to Namid desert. Drive time: 10 hr. Day 9 – Drive to Swakopmund (Walvis Bay) on the Atlantic. Drive time: 7 hr. Day 11 – Drive to Damaraland. Drive time: 7 hr. 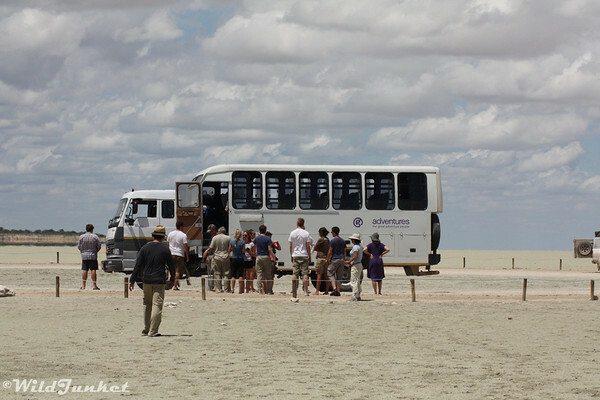 Day 12 – Drive to Etosha Nat’l Park (game drive in afternoon). Camp at Okaukuejo. Drive time: 8 hr. Day 13 – Another game drive on the way to East side of Park. Day 14 – One last game drive before driving to Waterberg Plateau Game Park. Take a walk in the forest or hike up the plateau. Drive time: 6 hr. Day 15 – Drive to Windhoek. Drive time: 4 hr. Day 16 – Drive to Kalahari (crossing Botswana border) (take walk with bushmen). See town of Ghanzi. Drive time: 9 hr. Day 17 – Drive to Maun (stock up on supplies for 2 nights in Okavango Delta. Drive time: 7 hr. Day 18 – Drive 1-2 hrs. then board a mokoro (dug-out canoe) for 2 hour trip to where we camp in the Delta. Day 19 – Okavango Delta. Day 20 – Take mokoro canoe, then drive back to Maun (p/u luggage) then drive 5 hours to Gweta (between the larger towns of Nata and Maun and on the edge of the Makgadikgadi Pans). Drive time: 5 hrs. Day 21 – Drive to Chobe Nat’l Park – camp near the town of Kasane. In the afternoon, take an optional game drive in the park, or an afternoon sunset boat cruise along the Chobe River, which is the best opportunity to view hippo, crocodiles and watch many elephants wallow in the water. Day 22 – Drive to Livingston (Victoria Falls). Drive time: 4 hr. Take an optional early morning game drive in Chobe before leaving for Zambia. Cross the Zambezi River to enter into Zambia and continue to Livingstone. We will spend the next three days of our tour here. A great base to see both some natural wonders and take part in some exciting activities. Get up close (and wet from the spray) while awing at the immense Victoria Falls, raft the whitewater of the mighty Zambezi, for the more adventurous, bungee jump with the Victoria Falls in view. Day 23 – 25 – Livingston. Day 26 – Today’s long journey across rough and bumpy roads takes us to a private game farm 20km’s outside of Lusaka, the capital of Zambia. Here we’ll marvel at the Zebras, Buffalos, and the Boks that roam the property, or relax by the pool or at the rest camp’s bar. Drive time: 7 hrs. Day 27 – Travel north east up through the Zambian country-side, to the capital of the Eastern Province, Chipata. Please note that as this is a long driving day we will not be able to visit the town of Chipata. Drive time: 10 hrs. Day 28 – 31 – Spend four nights relaxing on the shores of “the Lake of Stars”. Beach walks, swimming in the crystal clear water and snorkeling are some of the activities in the area. Visit various lakeside camps as we travel north along the shores of Lake Malawi. This is Malawi’s main attraction and covers one fifth of the country. It is the third largest lake in Africa and is about 500km long. The lake has more fish species than any other lake in the world with around 600 different species. The lake is also known for its good snorkeling and diving. Day 32 – Begin the day by making the border crossing out of Malawi and into Tanzania. Climbing out of the Great Rift Valley through some spectacular mountain passes, view the vast tea plantations in the highlands along the way as you make camp outside Iringa. Drive time: 9 hrs. Day 33 – Travel to Dar Es Salaam. Drive time: 12 hr. Remember that Zanzibar is a Muslim society, and immodestly dressed women, or men in shorts, will get harassed and cause great offense in Stone Town. In Nungwi, customs are a little more relaxed, but passengers are encouraged to be respectful of the islands culture and still cover up when walking around. Never try to take a photograph without asking permission. The polite way to ask is “Tafadhali (pronounced tougher-thaarli) naomba ruhusu kwa kupiga picha yako.” Many guidebooks say the correct phrase is “nataka kupiga picha yako”, but this is incredibly rude, the equivalent of saying “give me your picture”. Day 34 – Take the 3 hr. ferry to Zanzibar – After arriving – spend the remainder of the day exploring Stone Town, the heart of the island. It has an intriguing maze of narrow, cobbled lanes hemmed in by Arabic buildings. The best way to see the Stone Town is, literally, to get lost. You can spend hours just wandering the alleys and squares, drinking potent coffee from pavement vendors, or buying sweetmeats from scores of tiny cafes. At this point other G Adventures travelers may join you, who are continuing their tour here on Zanzibar. A group meeting with your tour leader is scheduled for the early evening. Day 35 – 36 – No visit to Zanzibar would be complete without a visit to the spice plantations – an activity that is included on our way north to Nungwi. It was the wonderful spice plantations that brought the beginnings of Zanzibar’s infamous slave trade dating back to the 1840’s. Drive time: 4 hrs. (including 2 hr. spice tour). Stay in Nungwi for two days/ two nights at one of Zanzibar’s major highlights. Here you can either relax on the idyllic white-sandy beaches, take an optional diving/snorkeling excursion, or take a wander through the village of Nungwi. Day 37 – Drive back to Stone Town. Drive time: 2 hr. Day 38 – Take Ferry back to Dar Es Salaam. Drive time: 3 hr. It’s tons of driving and a lot of camping, but I can’t wait! !